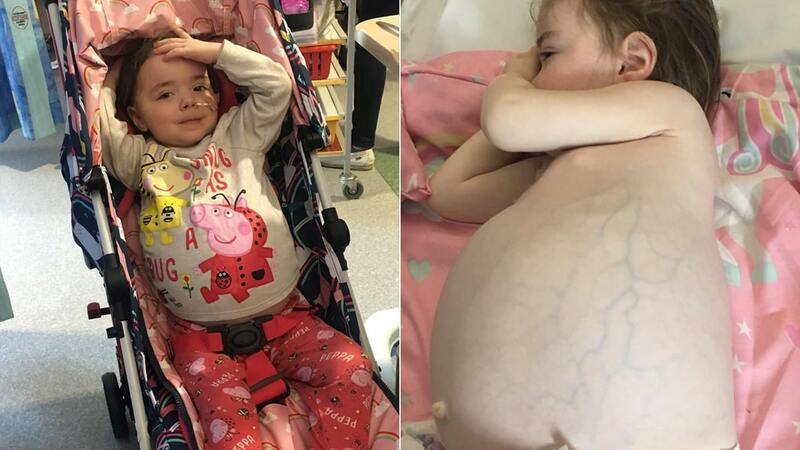 A toddler in the U.K. is facing a fight for life as she battles a rare and aggressive tumor that left her “looking pregnant.” Cleo Keenan has a tumor in her abdomen which caused her stomach to swell up like a balloon. Cleo, pictured center with her mom and siblings, is currently receiving chemotherapy to shrink the tumor before she undergoes surgery to remove it. She was given a CT scan, which revealed the huge tumor inside her abdomen, and she was taken to Manchester Children’s Hospital the next day. The family has now set up a Facebook page, called Cleo’s Chapter, to document the toddler’s cancer fight.